Congratulations to FileMaker, Inc. on the release today of version 16 of the platform. 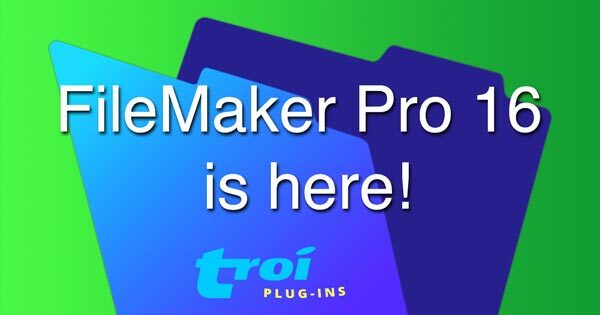 We have been working hard to prepare our plug-ins for FileMaker 16. Later today we will release more information. Stay tuned or subscribe to our newsletter. The release of Version 16 of the FileMaker Platform brings a lot of new features also for plug-ins. Selecting External Script Steps in the right pane of the Script Workspace. One of the most exciting new things possible in FileMaker Pro 16 is adding new script steps to the FileMaker application. You can select these script steps in the script steps pane in Script Workspace, or you can begin typing the script step name, then choose the script step from the list that appears. The script steps significantly expand the possible actions you can perform with FileMaker Pro. Only steps that perform an action make sense to be added as a script step. 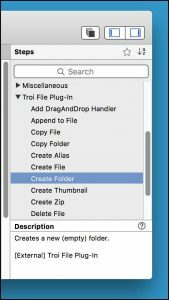 Functions that just return information (like for example TrFile_GetFileSize of the Troi File Plug-in) are still available as an external function. FileMaker 16 also adds granular support for online help for the functions and script steps of plugins. You can now easily get online help from the Troi website, by clicking the Help button (the small question mark button) next to the function description in the functions pane or the script step description in the script steps pane. Troi will release more information soon about the compatibility of our plug-ins. Stay tuned or subscribe to our newsletter on our home page.